Photo Courtesy: Frederator Networks, Inc.
For me, the fight between our trio and a group of master vampires in Dracula’s castle toward the end is the highlight of the series. 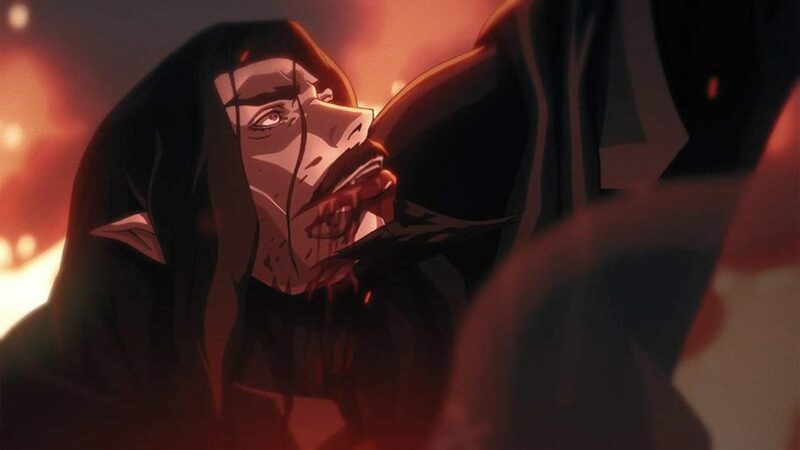 Much as grandmaster vampire Jan Valek drew master vampires to his cause in the movie John Carpenter’s Vampires, so does Dracula in this animated series. These lieutenants are pulled from around the globe, dressed in ornate garb from different countries and excel in different vampire abilities. I particularly liked the Asian vampire who was adept at turning into mist. She was particularly hard to take down, but it was quite the battle to behold. Not that our trio isn’t up to the task. The Castlevania video games often have you stepping into the whip-welding shoes of one of the Belmont family and the series is no exception. Throughout the series, we follow Trevor Belmont from Castlevania III: Dracula’s Curse — often considered one of the Top 10 games for the Nintendo Entertainment System (NES). He’s young, surly and drinks too much, but he’s got a knack for killing vampires and wields his whip with aplomb. If there’s ever an animated Indiana Jones or Catwoman series, I’d want them to showcase the kind of stellar whip animation in this astonishing anime style featured in the Castlevania series. Belmont also gets a stellar whip “upgrade” (if you will) this season. I don’t wanna reveal what it is, but it’s really cool. This season, we watch Belmont bond with Sypha Belnades, who he recruited to his cause last season. She wields some incredible elemental magic. Only a bit is showcased early on, but she really gets to shine in the final battle. Her fireballs and control of flame is always devastating to the undead. However, it’s her clever use of ice spikes against the vampires that I really liked. Also, I was in awe of her use and control of a wall of ice against one of the master vampires on Dracula’s war council. Dracula’s son, Alucard, has also allied himself with Belmont and Sypha, against his father. Half-human, half-vampire, he’s very much like D from the anime and manga Vampire Hunter D. I’m totally cool with that, because I really liked the second anime movie. And for anyone who’s seen Blade, you know this is the perfect kind of character to fight vampires, because they have “all of their strengths, none of their weaknesses.” Alucard has a great fight against Dracula in Season 2, but I wish this season had explored the relationship between father and son. The dynamic seemed emotional, but without any flashbacks to strengthen their conflict, the drama doesn’t seem as strong as it could be. There’s actually not much exploration of Dracula this season. It seems like a real missed opportunity. There’s only one flashback in a story he tells — a way to remind us why he’s referred to as Vlad the Impaler — but it’s nowhere near as good a story as the one shown in the movie Dracula Untold. Instead of delving more into the Dracula character, this season decides to devote its time to the two humans on Dracula’s war council. These two are forgemasters who use their ability to reanimate the dead to add to their master’s legions. They’re not creating more vampires with their alchemy, but other horrors and creatures of the night. Their flashbacks, motivations and reasons for despising the rest of humanity are interesting… but seem like a waste when you consider this time could have been devoted to flesh out the rest of the main characters. One of the new rising stars this season is Carmilla. Much like the Countess Carmilla in Vampire Hunter D: Bloodlust, she is based off the title vampire in the 1897 gothic novella, which predates Bram Stoker’s Dracula novel. Although she’s ostentatiously allied herself with Dracula’s cause in Castlevania, she becomes a powerful rival in her own right. Her motivations could have used some depth and the cutaway to her backstory isn’t nearly enough. Because she’s not one of Dracula’s children and under his thrall, I would have liked to see how this strong, independent vampire came to be and how she rose to power. Carmilla’s backstory isn’t the only character’s history left unexplored. Our trio of heroes is the biggest missed opportunity. It’s not like there wasn’t time to reflect — for a big chunk of this season they’re hold up in the Belmont family library researching ways to stop Dracula. It’s the low point of Season 2 and would’ve been a good time for some character flashbacks. Considering how strong the voice cast is, a voice-over narrative would’ve been well-received, if accompanied by some amazing action flashbacks. There are enough action scenes sprinkled throughout this season to keep the audience glued to the screen. Each episode is also really short and Season 2 is only eight episodes long, which makes Castlevania easy to binge-watch. I watched the whole season in a day and didn’t regret it, especially how great the final conflict was. I enjoy good vampire fiction in film, TV and anime. I like watching even more when we have some cool vampire hunters ready to go toe-to-toe with the forces of the undead. For me, Season 2 of Castlevania was great and riveting to watch.